This is a loose ring dressage bradoon. It has a shaped AURIGAN mouthpiece and stainless steel cheeks. AURIGAN bits produce a distinctive and pleasant taste that causes horses to salivate more. AURIGAN is a nickel-free alloy combining 85% copper, 11% zinc, and 4% silicon. This bit affects the tongue, bars and lips. The shaped mouthpiece contours to the tongue, allowing increased contact and better pressure distribution. 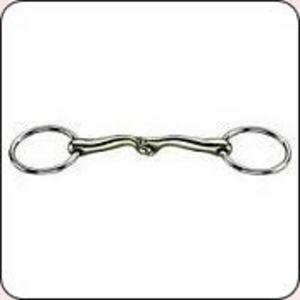 It is less likely than a standard single joint snaffle to affect the horse's palate. SIZE: 140 mm. Mouthpiece thickness, 16mm. Ring diameter, 55mm.